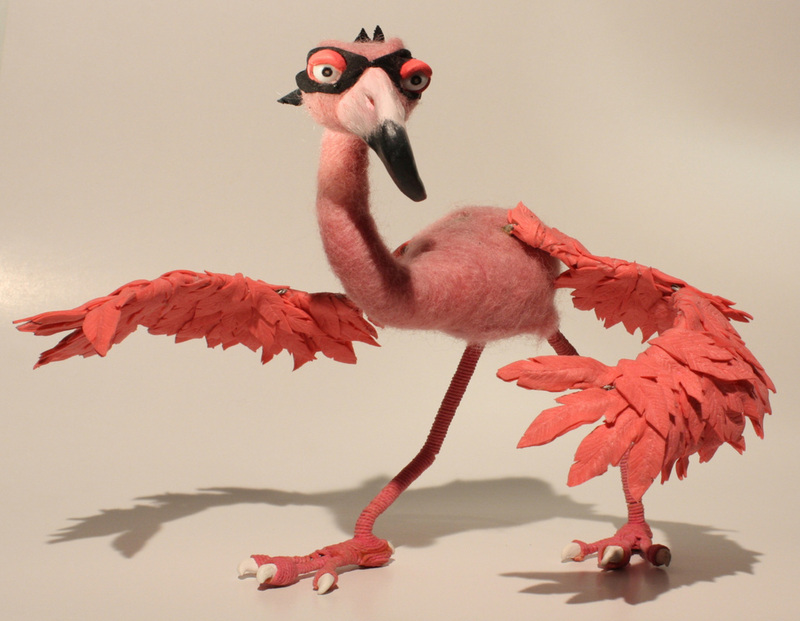 The initial thought behind having a flamingo as a notorious art thief was because flamingos would be naturally ill-suited for this, as they can't help but stand out. 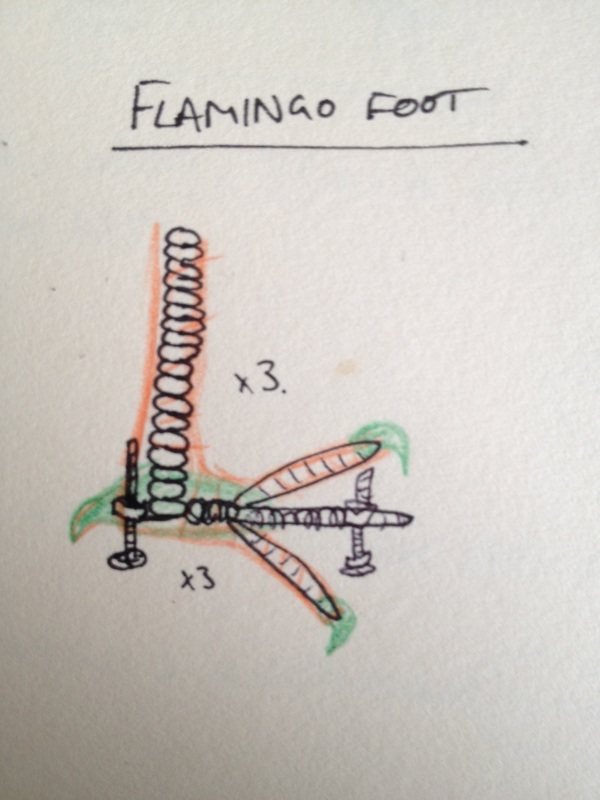 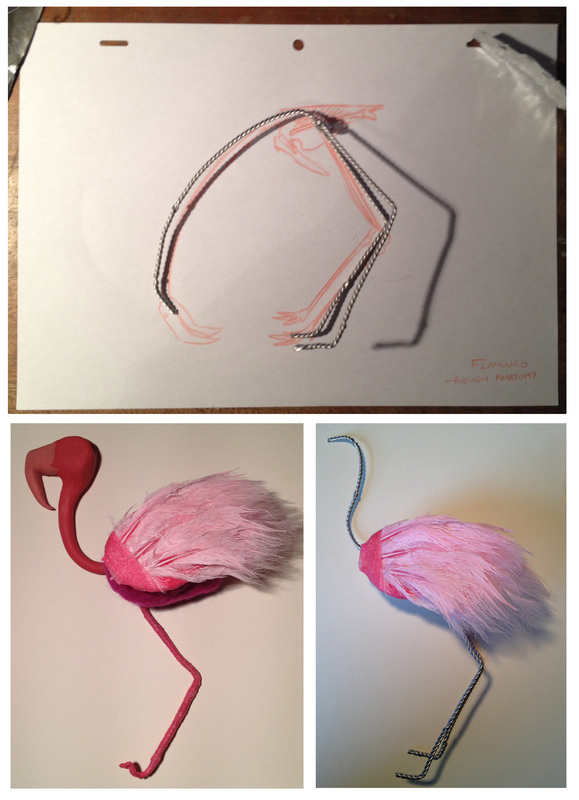 I've done research into their anatomy and based my first technical drawing on the appearance of a real flamingo. 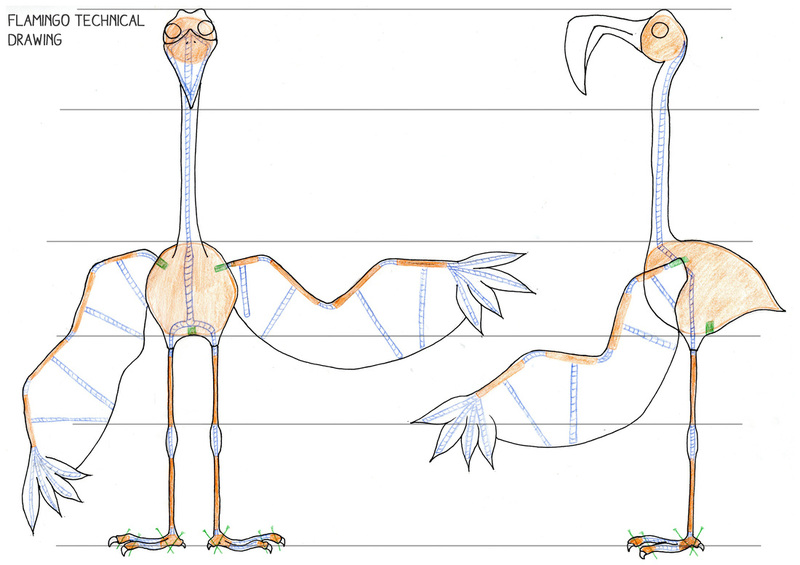 The design for the character will progress to be stylised but still resemble these proportions. 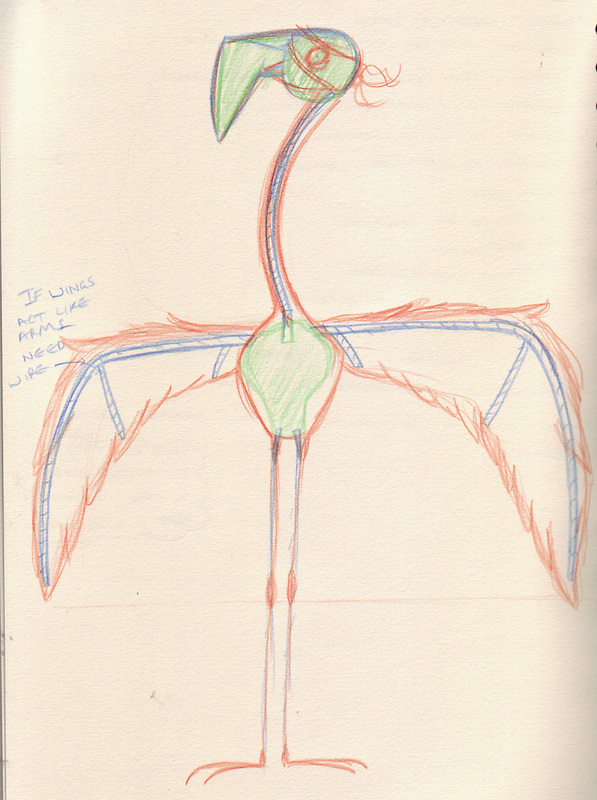 The character will be running throughout a lot of the animation and carrying a painting, therefore I plan for the wings to act more like arms than wings. 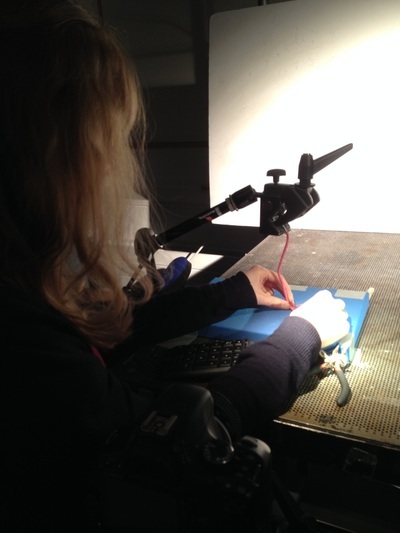 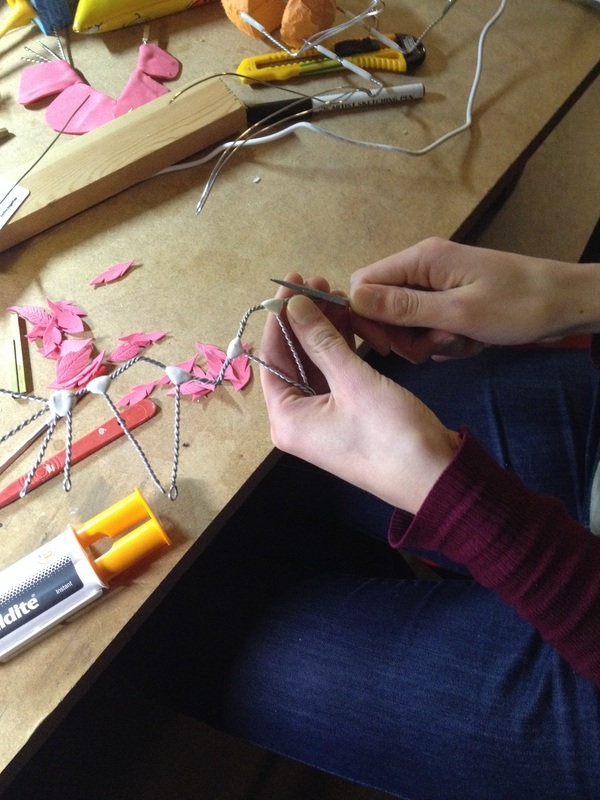 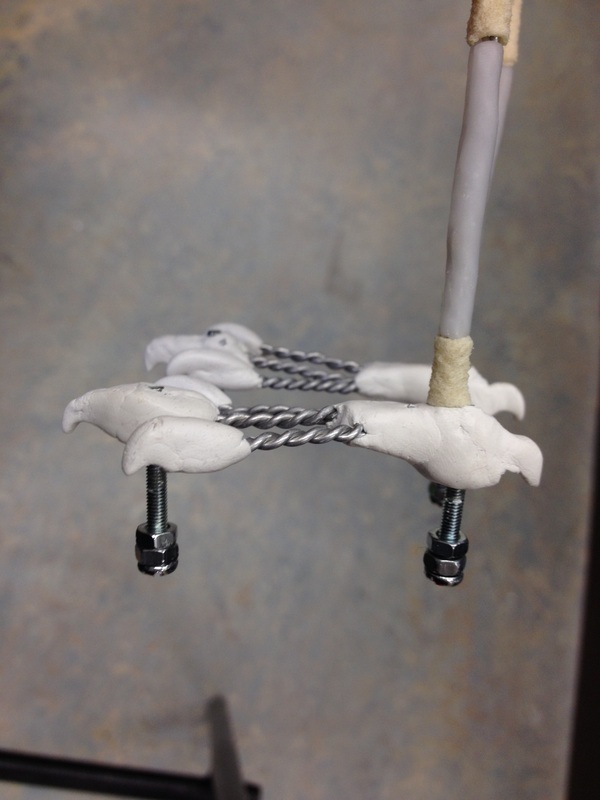 Some sort of 'hand' armature will have to be built into the wing. 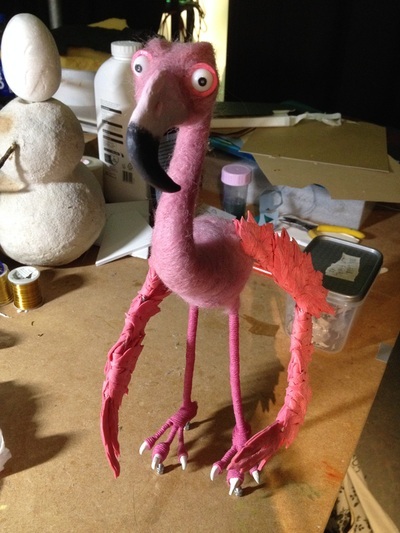 This was the first collection of tests, looking at many different materials and the range of appearances and qualities that they could bring to the puppet. 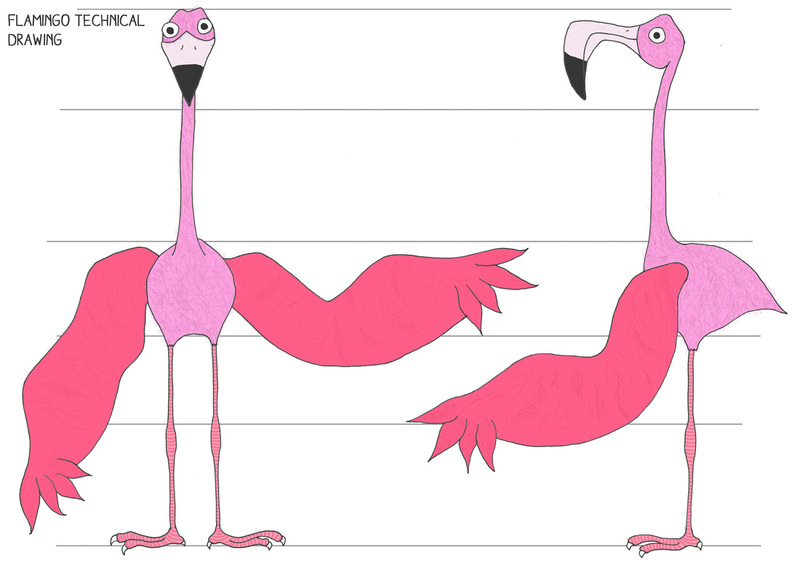 The feathers look promising in terms of mimicking the appearance of a flamingo, but using them would create issues of unwanted movement during animation. 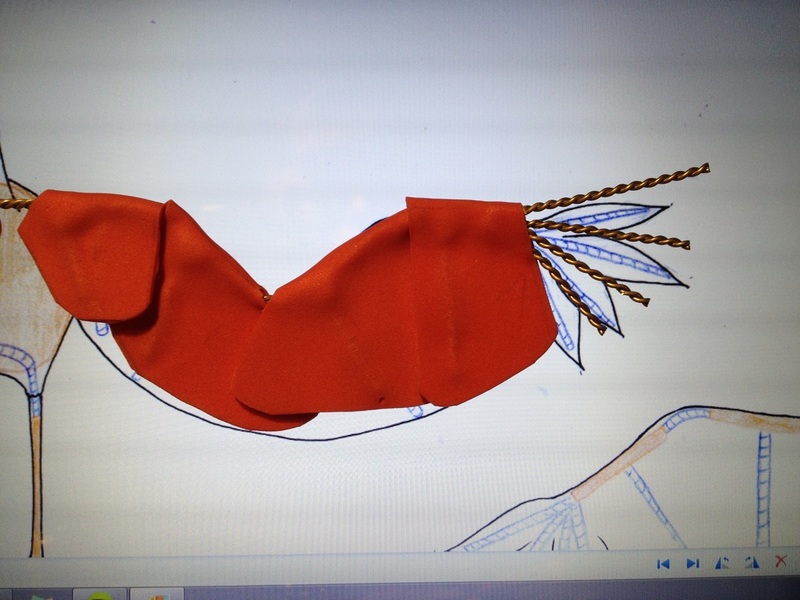 A couple of solutions include latex (which doesn't work) and hairspray, which looks promising (wing, above). 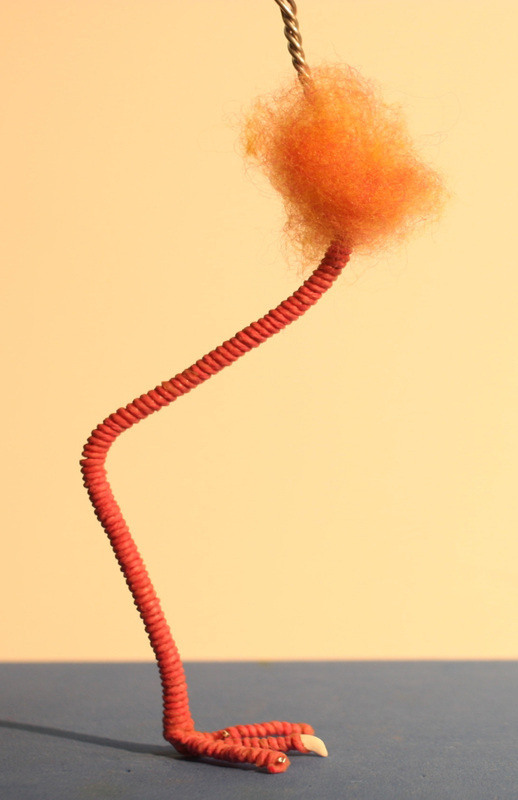 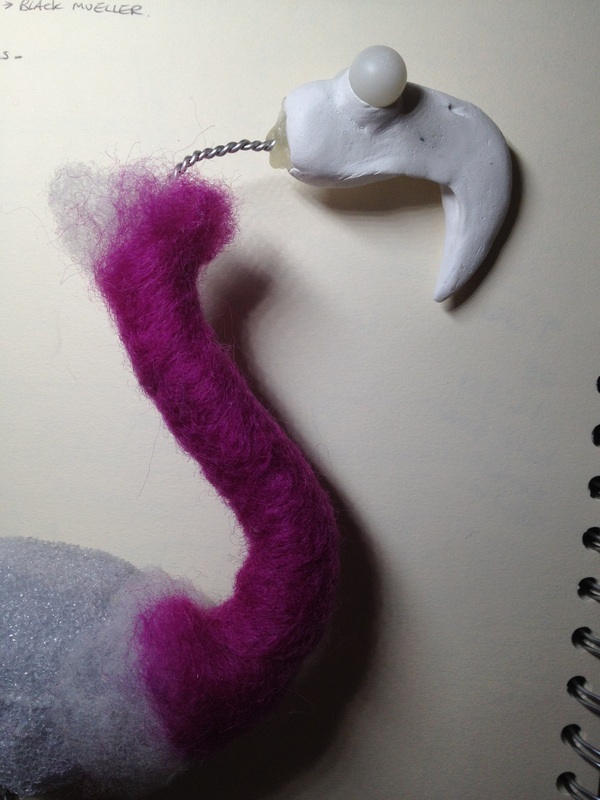 Needle felting the body is another possibility, but it's important to make sure there is a solid part of the armature, to keep the animation under control. 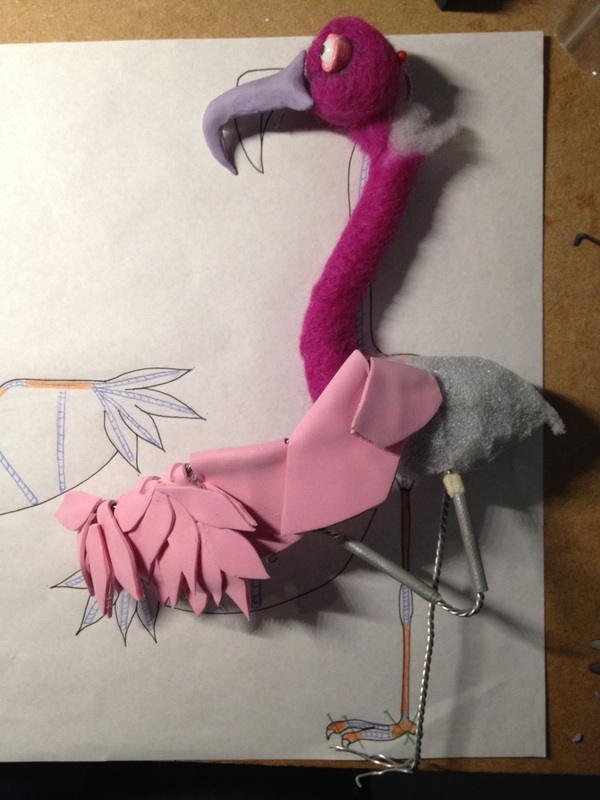 I started off using pink mueller wrap on a basic leg with bones made out of tape. 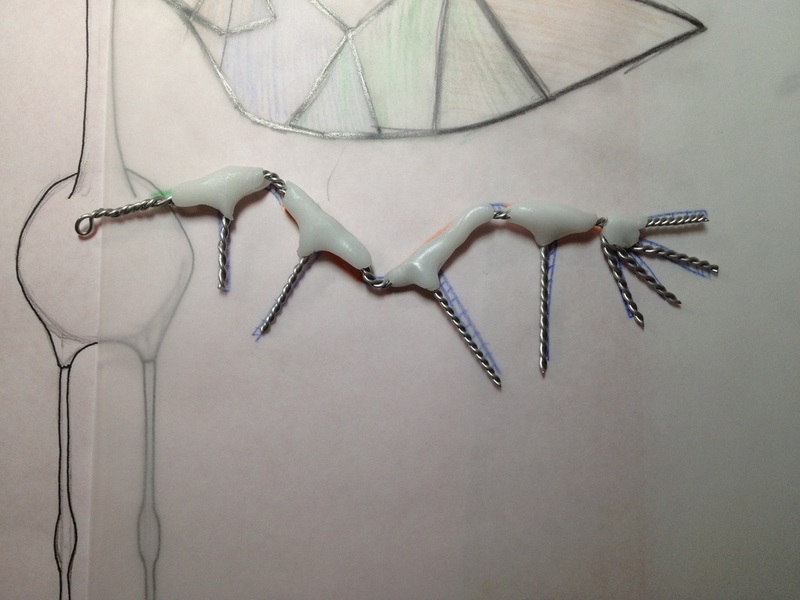 The leg needs to be built up to create a better shape but should still stay thin. 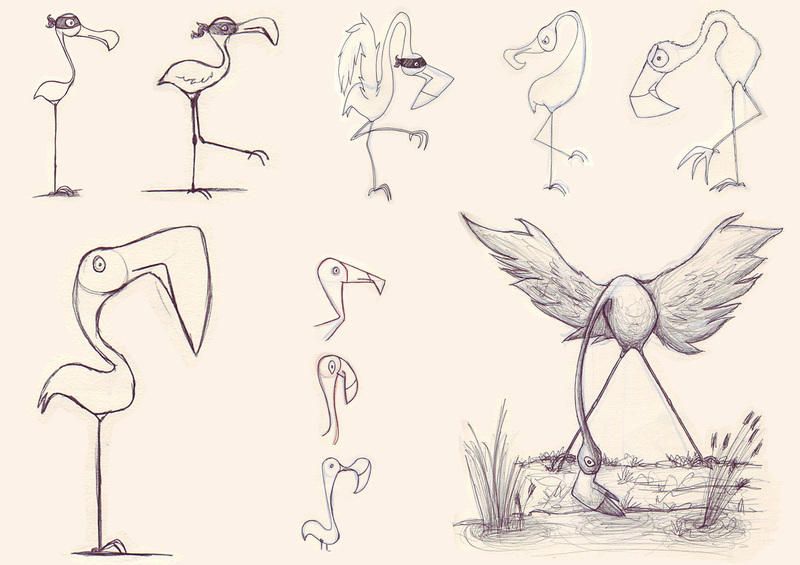 This first attempt is pretty crude, but could be refined a lot more. 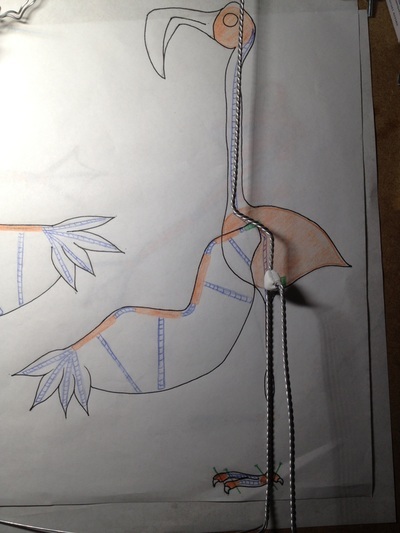 The movement works quite well, but tie downs need to be added into the design. This maquette is made using pink twine dipped in latex and wound around wire. 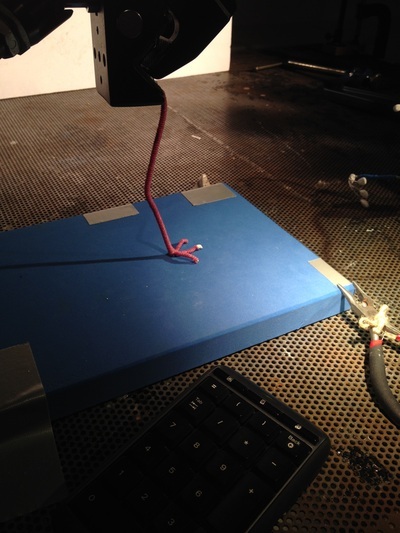 The aesthetic of this test is much better than the first. 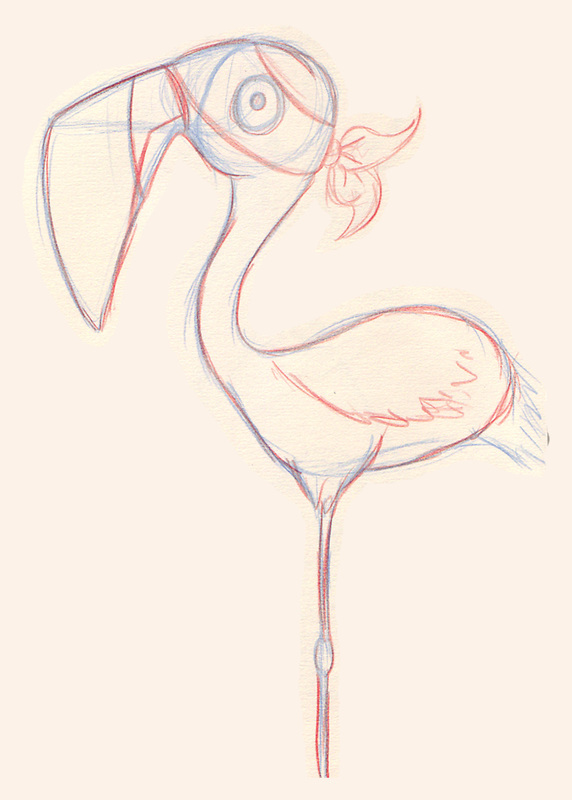 It has a real muppety look that I'm going for with this character. There are no bones built into this leg at all. 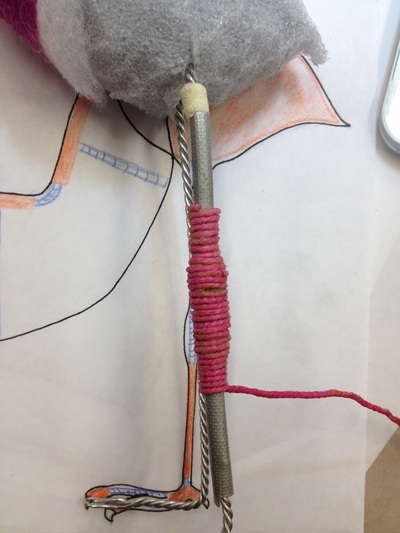 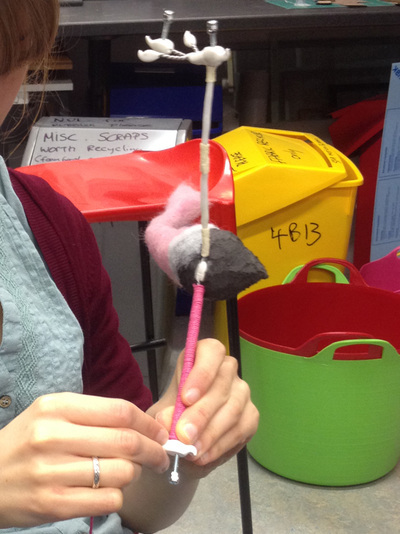 For future puppets it will be important to make sure the leg stays the same width throughout. 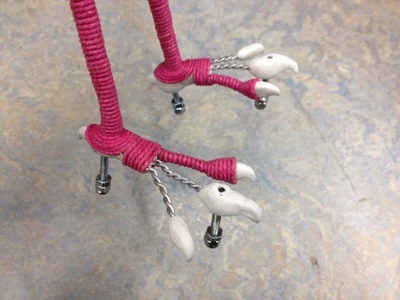 Using milliput in the feet works practically for the tie downs and looks aesthetically pleasing when incorporated into the design as the claws. 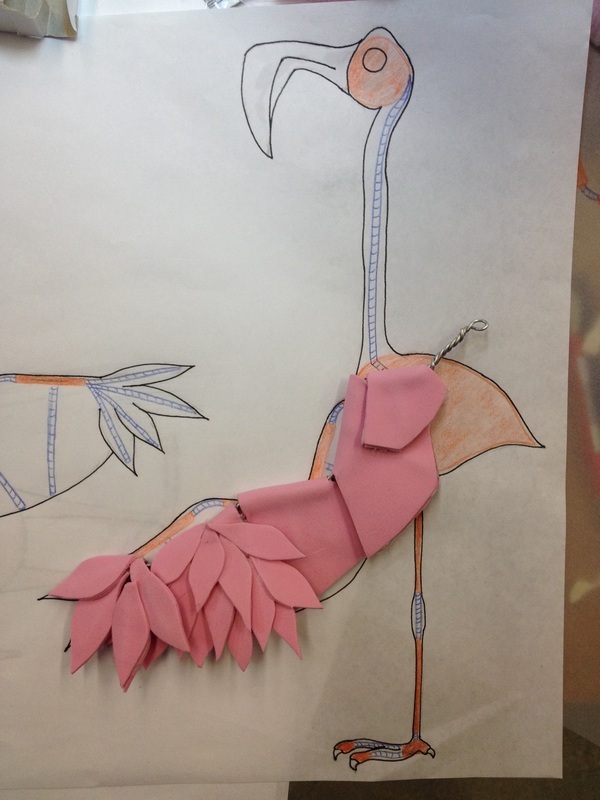 After making other components of the flamingo, I realised that the weight of the overall puppet may increase to the point where the yaw may make animation difficult. Using screw downs rather than pin downs would be far better for the structure of the puppet, as the design is fairly top-heavy. 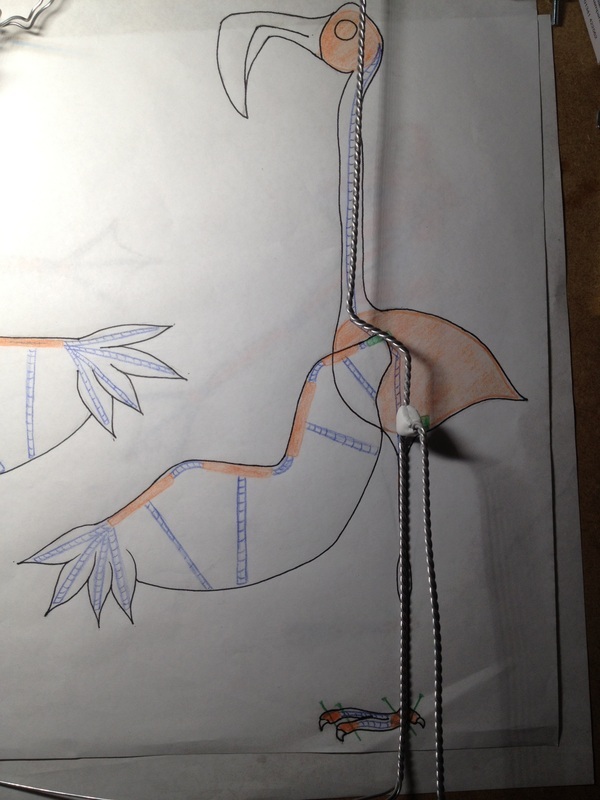 The screw downs should make the whole animation more steady. 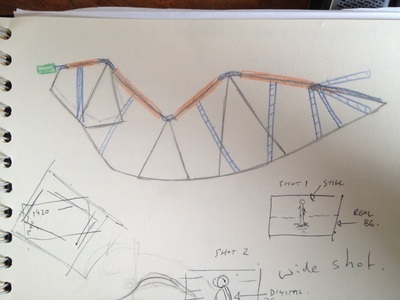 It will alter what material the floor is made out of, which will have to be considered when designing the set. 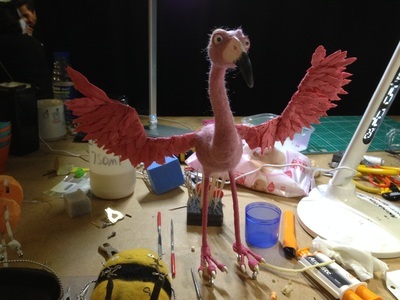 The look of this neoprene maquette works really well, but the animation was difficult due to the weight of the wing and also the movement in general wasn't easy to control. 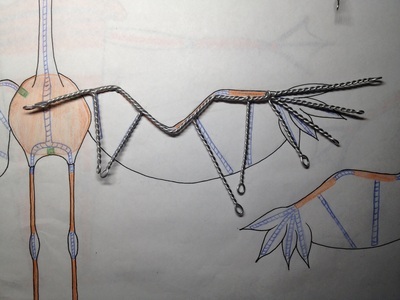 Further research into the anatomy and mechanics of bird's wings is needed. 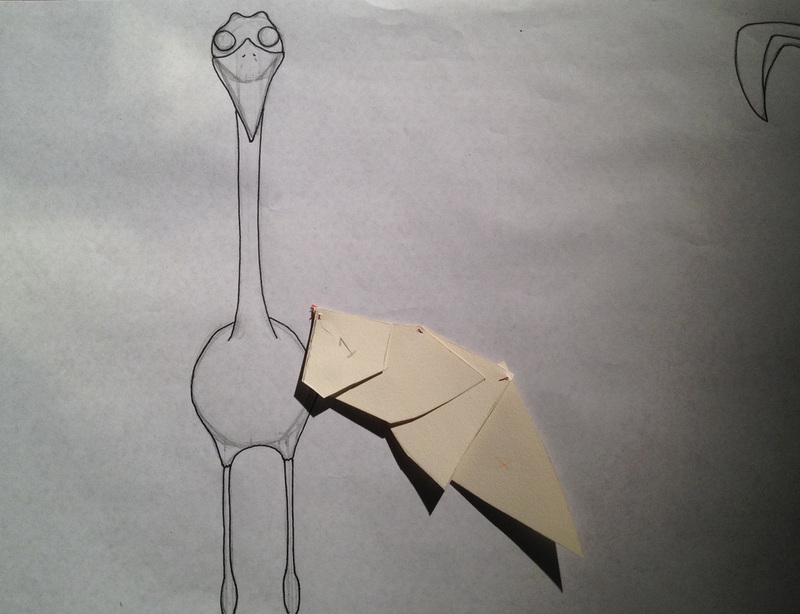 After researching the anatomy of a bird's wing, I created a maquette out of paper to test how the movement of a segmented wing would animate. 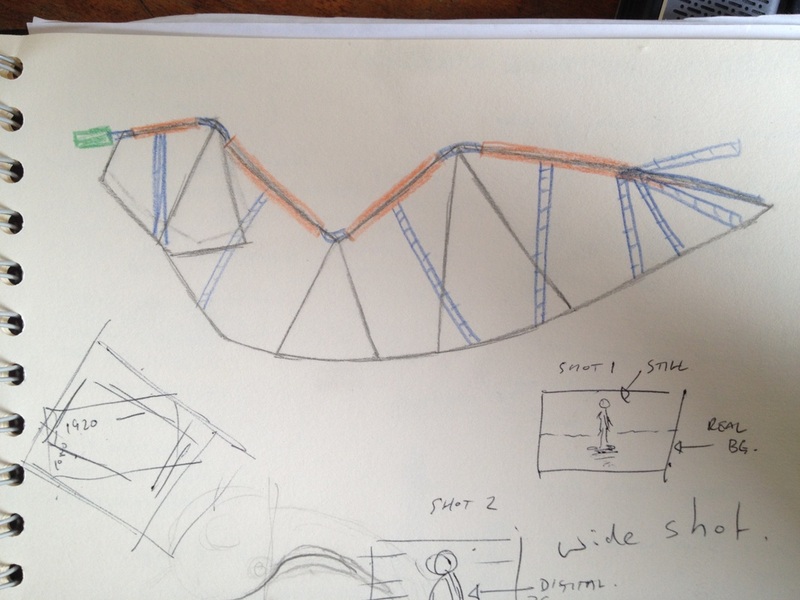 It turned out successfully, so I went on to design a technical drawing for the structure of the wing to take it from 2D to 3D. The series of tests show the development of the wing design. 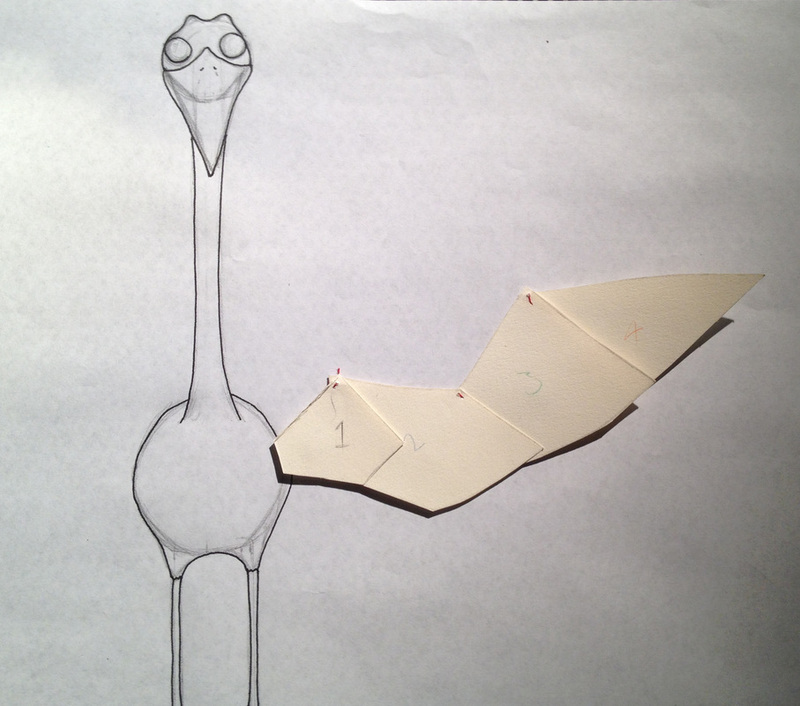 I took the paper wing and created a technical drawing from it. 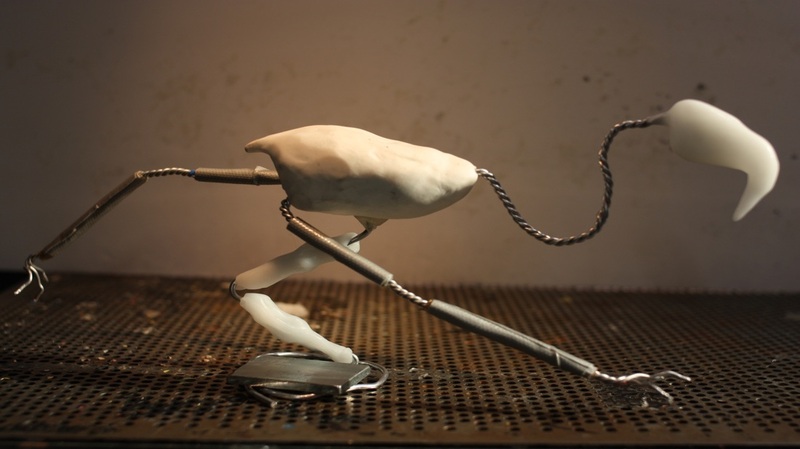 The first wire version with polymorph bones worked well mechanically, but aesthetically was too heavy and too chunky to skin over neatly. 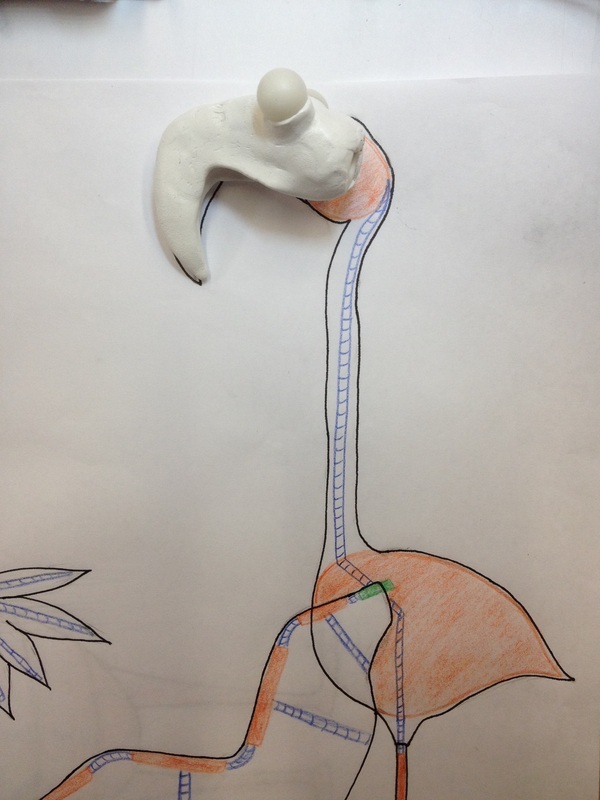 I removed the polymorph, skinned it without bones and found that the foam I used created its own structure. 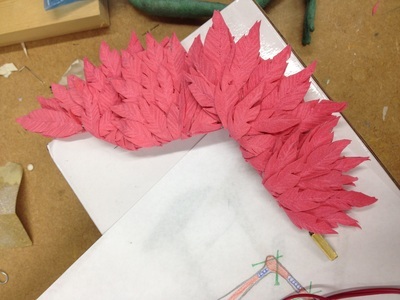 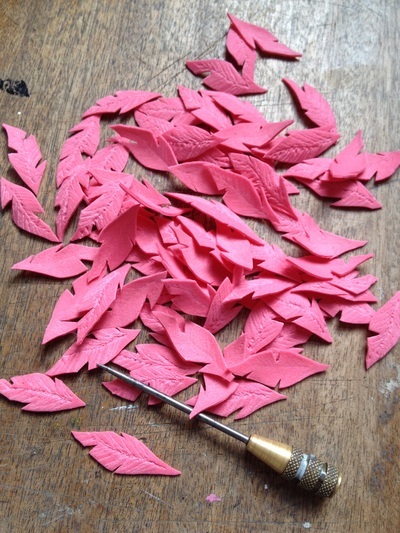 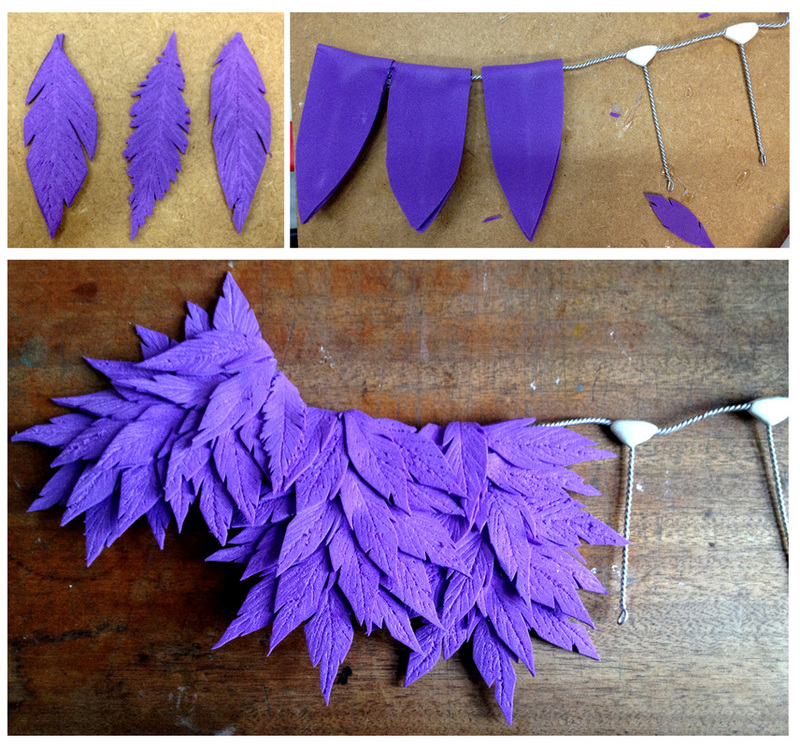 This is the method I'll use to create the final wings, but will cover the wing segments in individually cut feathers the same as the first maquette I made. 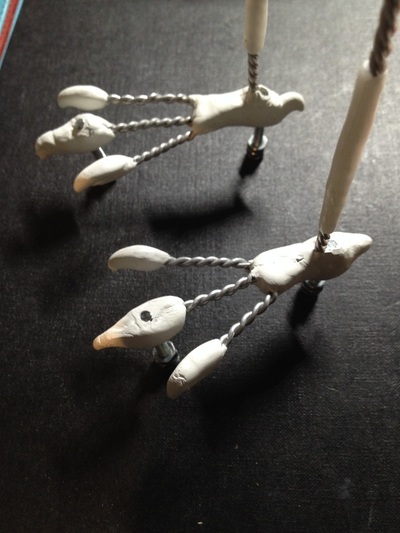 The test (top left) is made using just sculpey, with the lower beak part being unbaked. 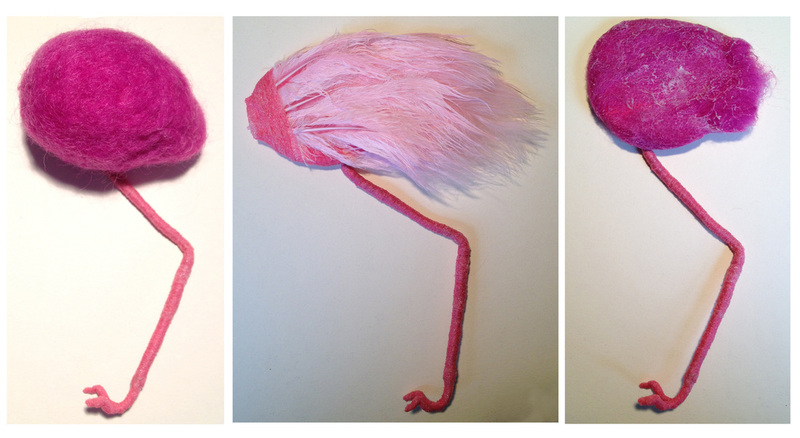 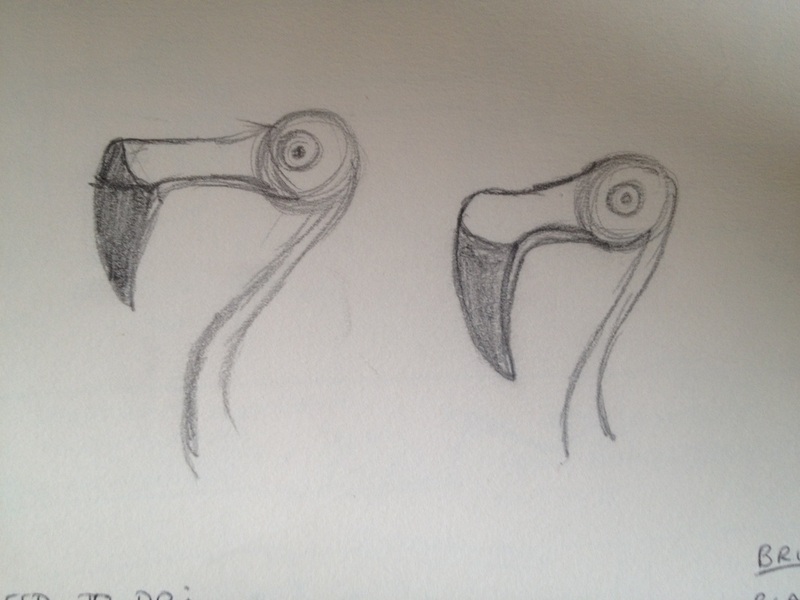 This was the first attempt at trying to make the flamingo's beak have some movement for different facial expressions. 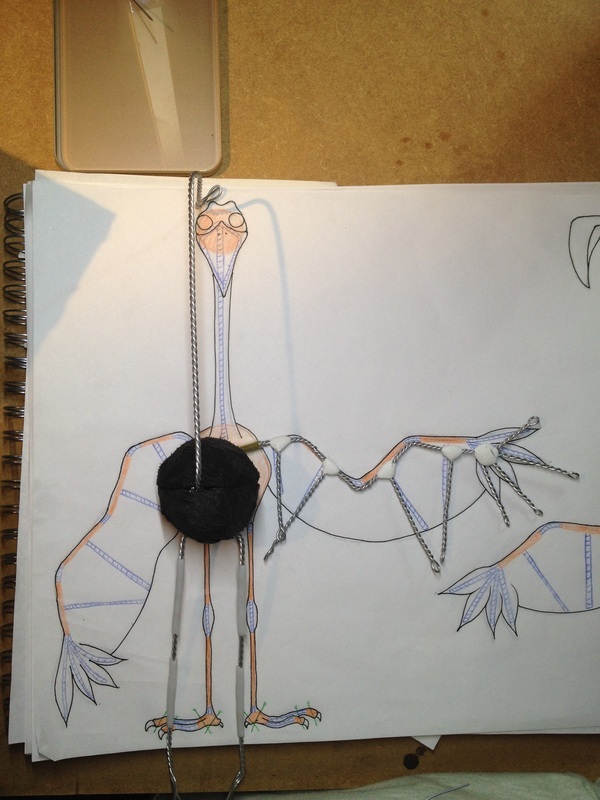 After animating this, it was obvious that it was too heavy. 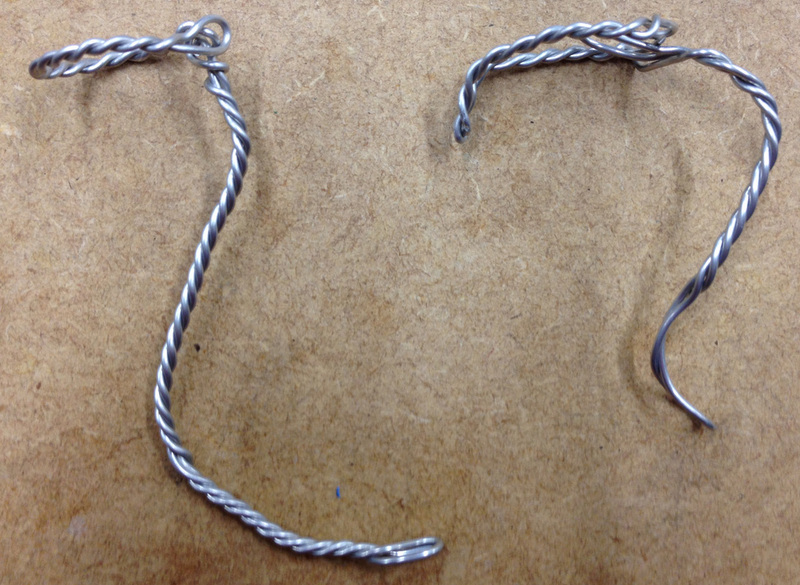 The wire for the neck should be thicker (maybe 3 wire twists, instead of 2) and also, the neck should come from more in the middle at the back of his head. 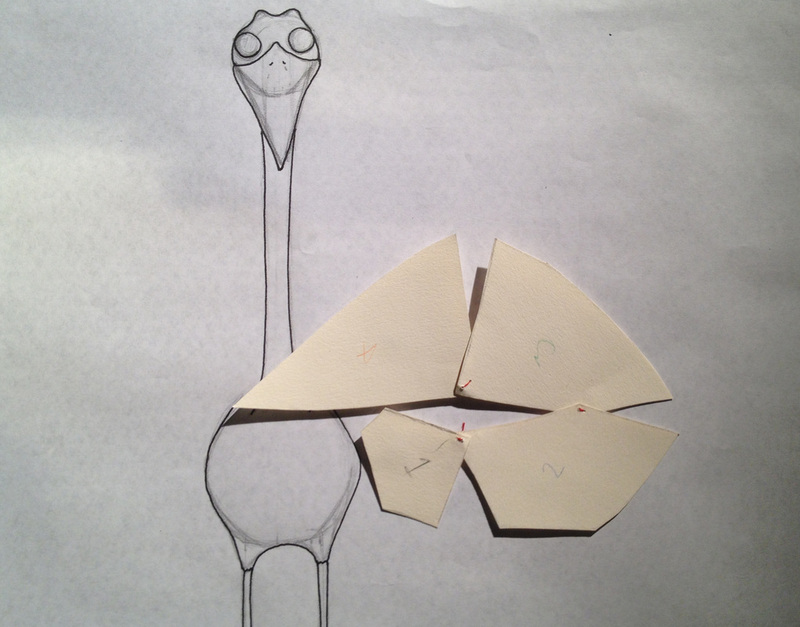 The maquette (top right) was the second attempt. 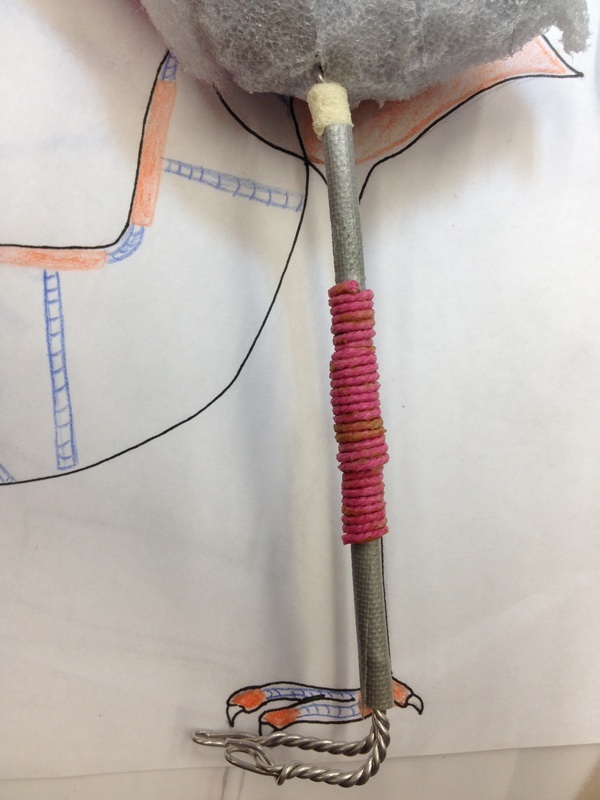 The core of the head is made of a lighter material and the neck supports the whole head a lot more from the middle. 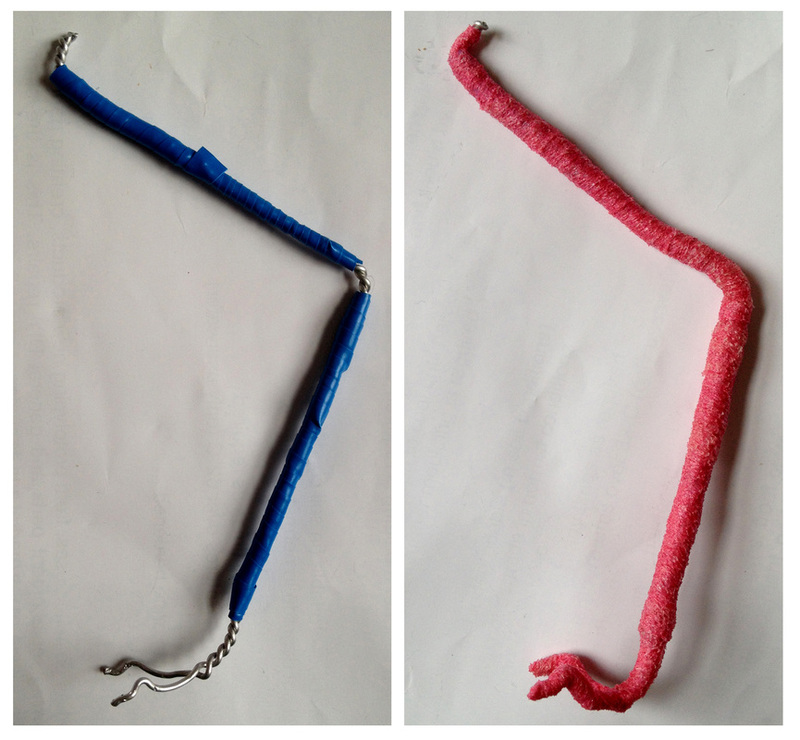 It could be made even lighter by replacing these materials with light weight alternatives. 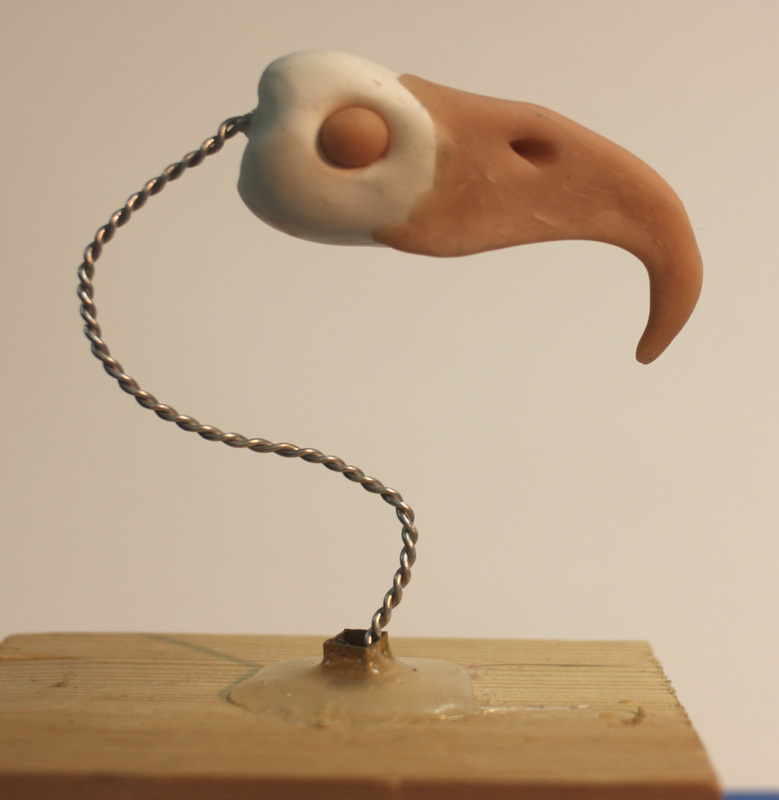 This prototype is made from an ultra-light sculpey core, with milliput eye sockets and milliput built up on the beak to add in detail. 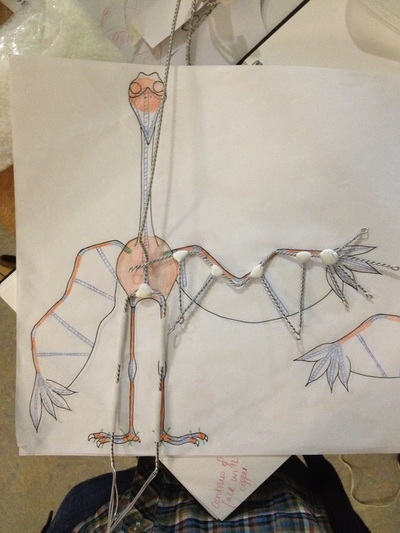 This prototype hasn't been skinned, but is already getting too heavy to be supported by a long neck. 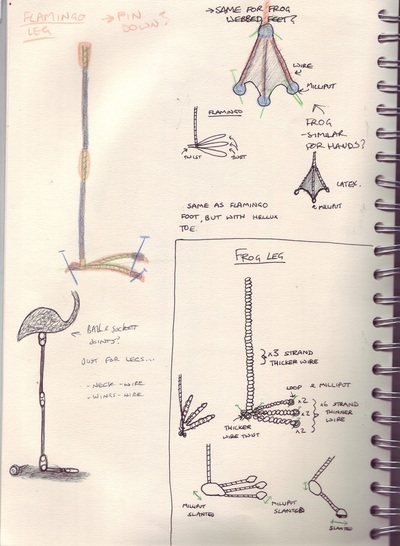 I'll develop the design to use even more lightweight materials for the next prototype. 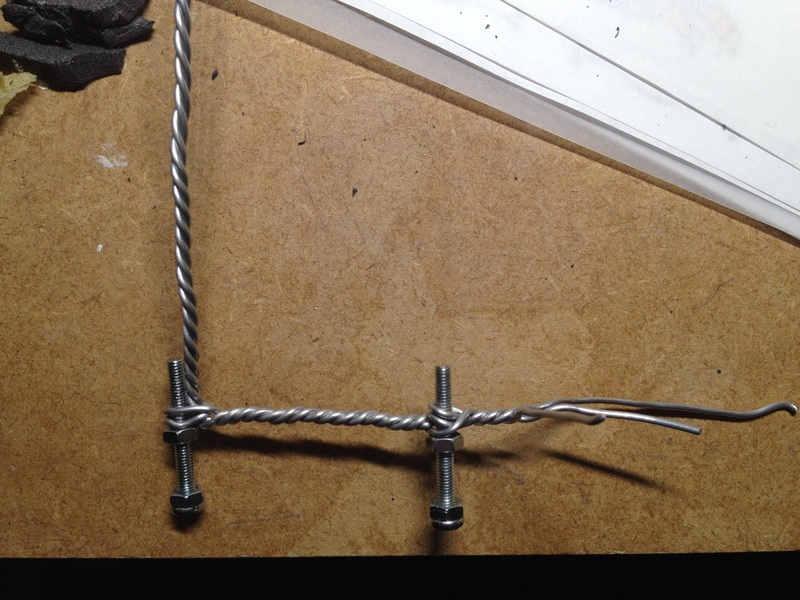 The base structure of this test works well though. 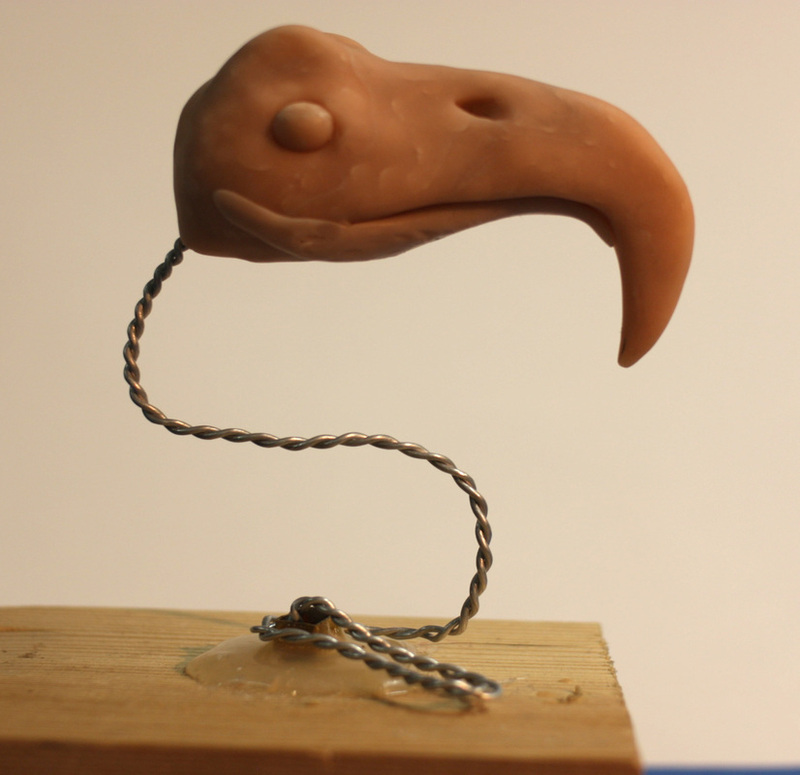 For the lower beak, I thought about putting an armature inside of it to control the movement, but realised this wouldn't be necessary, as the beak only moves in one direction and extra wire would mean extra weight. 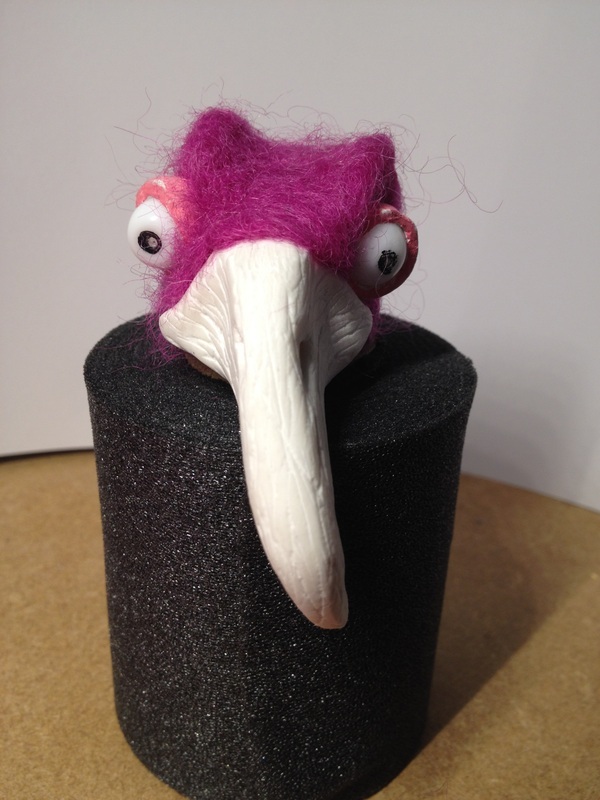 This head is structurally light and looks aesthetically how I wanted it to. 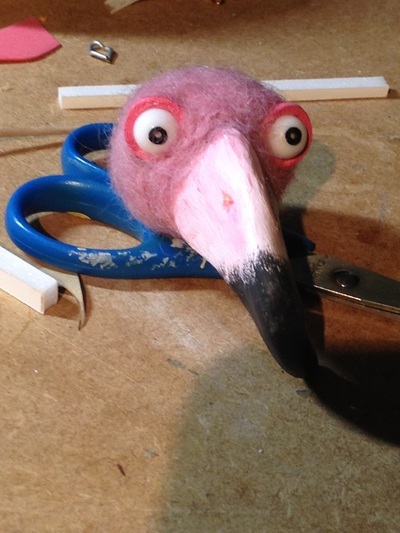 The lower beak will be made from baked sculpey that can literally be stuck onto the underside of the beak and replacements can be made to allow for simple movement. 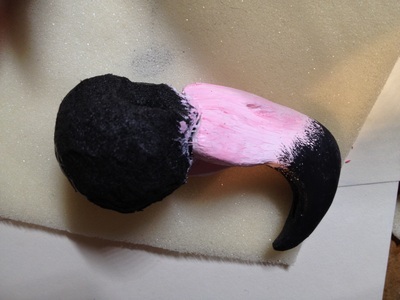 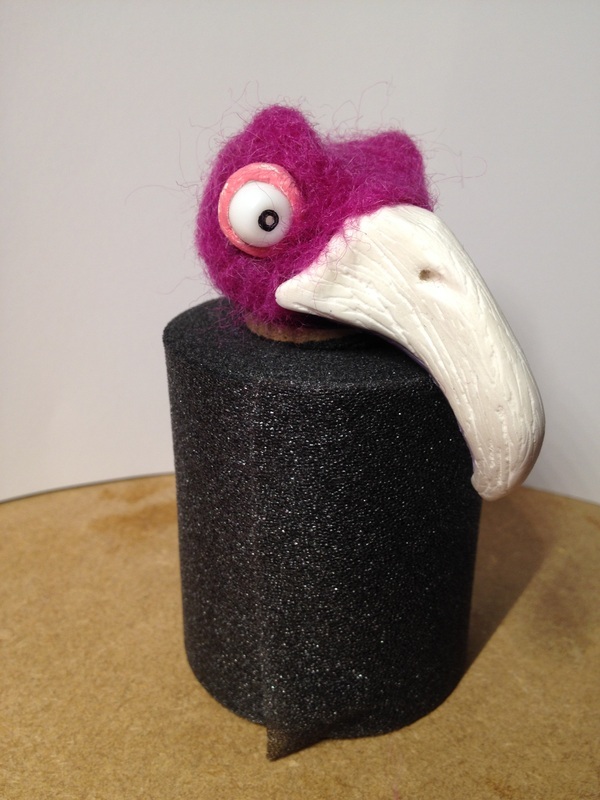 The core of this is neoprene, with an ultra-light sculpey beak glued into it. 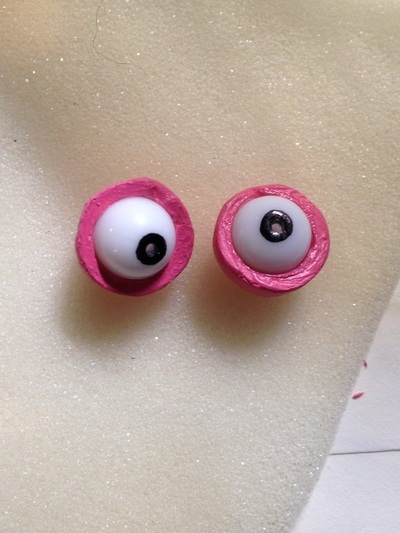 The eye sockets will be made from milliput, which creates a perfect bowl shape so the eyes can rotate.